Burn Hot Sauce is an organic fermented hot sauce made in Santa Cruz. The sauces are raw and alive, full of naturally occuring gut-healthy probiotics. Burn sources hot peppers from organic farms in California and ferment them in sea salt and water for up to a year! In this process lactobacillus is produced which naturally preserves burn hot sauce without pasteurization. These sauces are sugar free, gluten free, vinegar free, certified organic, probiotic, vegan, paleo, just three ingredients, handmade in California and got named “Best Hot Sauce” by Bon Appetit Magazine. Every bottle of Burn features the farm name and is single-origin. This artisanal hot sauce is sure to impress and is delicious on everything! 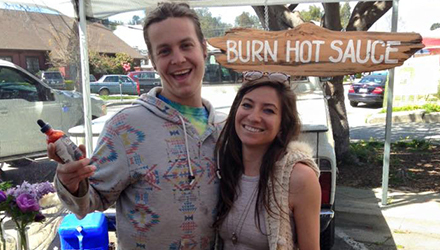 The Burn Hot Sauce booth also serves BREAKFAST at the Westside and Live Oak Farmers Markets every weekend. Come check it out for local organic seasonal eats that make you feel good. You will find vegan, vegetarian, gluten free and meat options available, and with a changing menu you will always find something to enjoy. Check them out on Instagram @burnhotsauce for giveaways and recipes! Burn hot sauce is made with 100% organic chilies grown in California. Burn hot sauce is packaged in glass, reusable bottles.